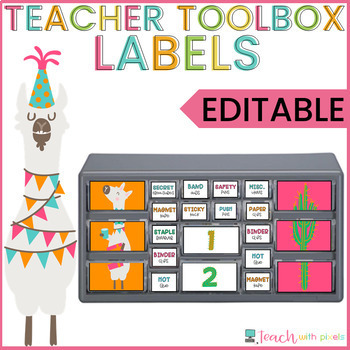 EDITABLE Colorful Llama and Cactus Teacher Toolbox Labels for CLassroom Organization. Full of templates to edit. If you like brights this is the classroom decorations set for you! This packet is part of this huge bundle for this Llama and Cactus Decor theme. The labels are sized approximately H 1.38″ x W 2.00″ and 2.12″ x W 4.25″ inches. It comes with pre-filled titles and EDITABLE labels as well. *Fonts are not included. I used two fonts from A Perfect Blend: 'Pumpkin Spice' from Fonts Volume One. And 'Central Perk' which is FREE.